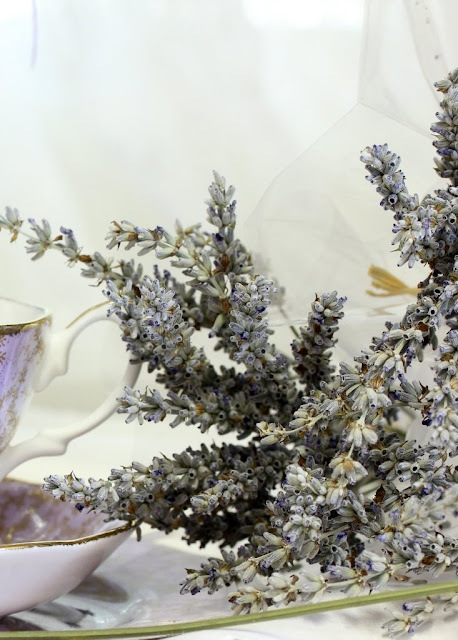 As you know from my past posts, I love Lavender and Tea. I found two beautiful tea cups, saucers and dessert plates at the Antique Mall. A very thrifty find. Later this year I'm giving a tea for my dear friends celebrating 42 years of friendship. 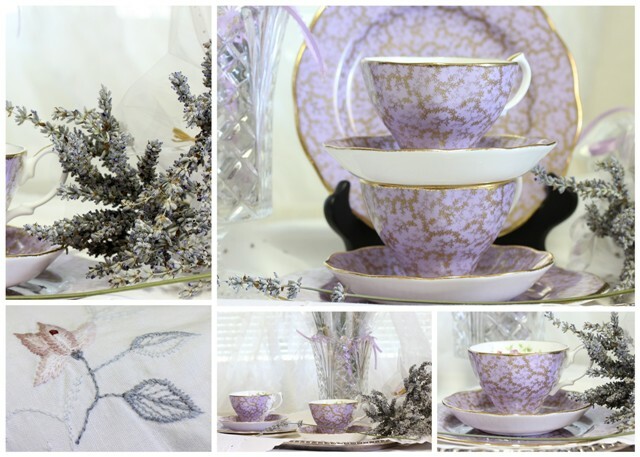 I have been collecting three piece tea sets and the two lavender sets were the last to complete a place setting for twelve. It's so nice to have a matching cup, saucer and dessert plate. 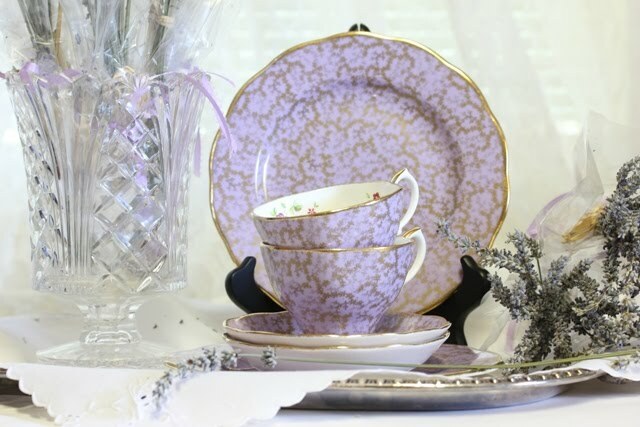 The tea cup, saucer and dessert plate are 'Lavender' Archive Collectable Teas, Royal Albert, Bone China. This vintage square table cloth is so lovely with my thrifty silver-plated tray on top. The vintage tea napkin is on top of the thrifty silver-plated tray. Oh the sweet smell of lavender from my garden. I hope you have enjoyed your visit to My Cozy Corner. I love sharing my treasures with such wonderful friends. I would appreciate a comment and become a follower too. I'm linking to the some fabulous blogs, so please link back and enjoy more fun. It's a lovely idea to celebrate friendship and what fun to collect china to make the occasion extra special. 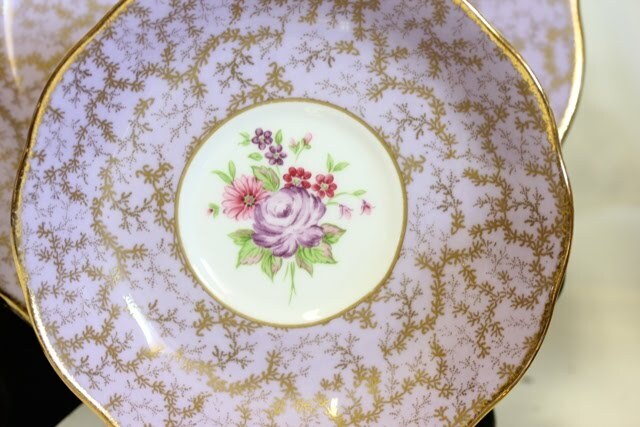 So beautiful teacups, perfect for a sweet tea time! Those cups are out of this world!!! 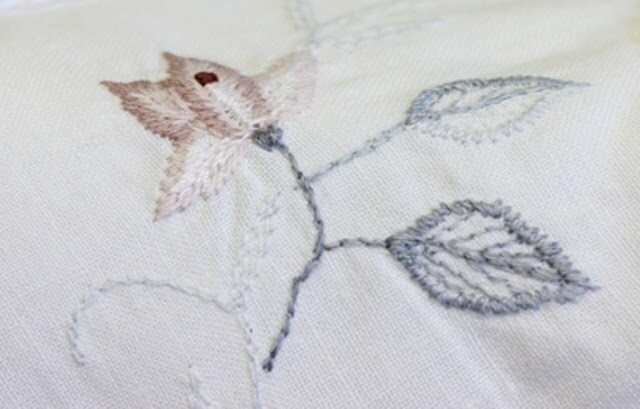 And, of course, I adore the embroidery on the tablecloth. The setting is wonderful. I also think lavender is an amazing plant. What a beautiful lavender post. We grow lots of lavender here at Pondside, but I never seem to harvest my own and end up buying it from the lavender farm. I spray my pillows with lavender water every night before I go to bed - a sure way to have sweet dreams. What a beautiful post and I love the teacups and that pattern is lovely! I think I need to buy some lavender! Oh so pretty, and great pics-enjoy! 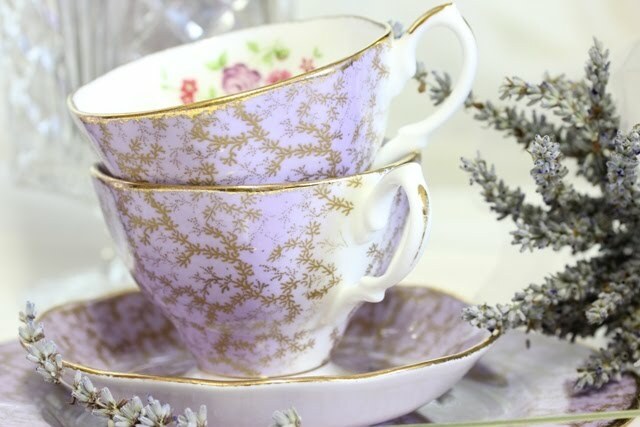 Betty, your lavender teacups are gorgeous as are all the pieces! 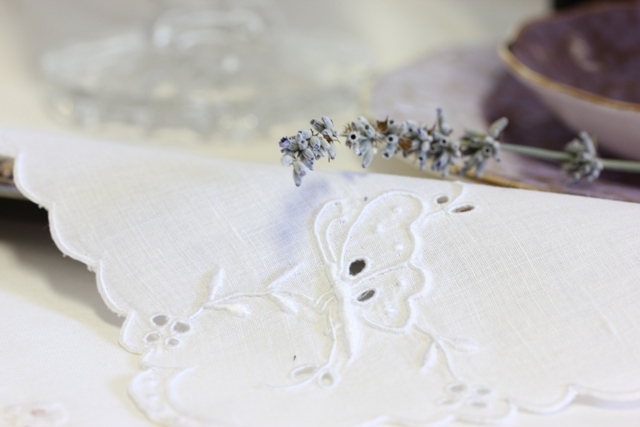 I love lavender too and how lovely your teascape is with both the china and the florals! How pretty is the little butterfly on the napkin! I'm sure your friends will enjoy your tea party very much and how nice to be celebrating such a long friendship! Thank you for sharing your beautiful treasures and thanks for joining me for tea! ps I'm your newest follower...come by and see me also.. This is my first time to your blog. I love your two new trios. They are stunning sitting amongst your lavender. Thanks so much for sharing. Happy Teacup Tuesday! Hi Betty! 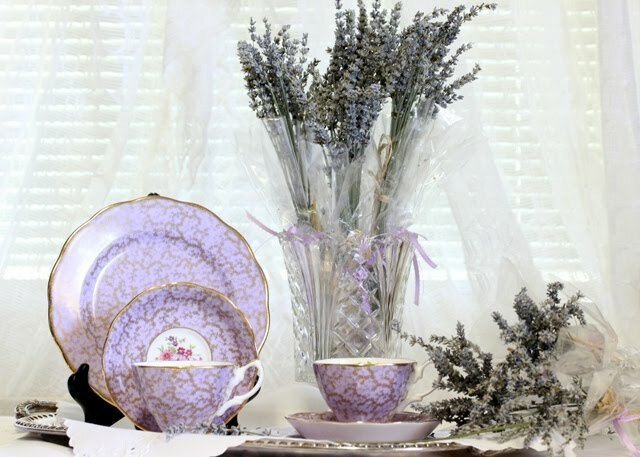 Oh, what a lovely setting with all your lavender, tea cups and loveliness! 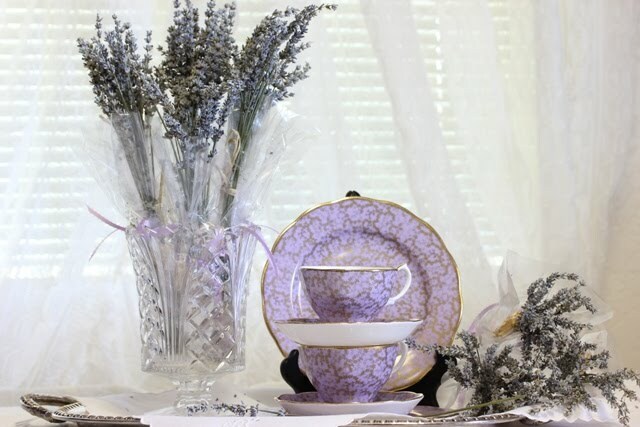 What a beautiful vignette that you created with a lovely tea cup!! I have enjoyed your Cozy Corner. Your tea cups and saucers are gorgeous. What a fabulous color! I have never seen this pattern before, and I do love it. Your photos of your table setting are very pretty. Thank you so much for sharing your tea cups with us for Tea Cup Tuesday. These are just lovely...I love lavender too...I can't wait to begin planting our new english garden and including many varieties amounge the roses. I can almost smell the lavender too. I love fresh lavender and lavender lemonade. The dishes are lovely especially with the linen. Your china and tablecloth are SO pretty!! I love the toucj of lavender sprigs, too. Have a fun tea! Ahhhhh fresh lavender from the garden! Your teacups are so pretty and I love the soothing shades you are showcasing! Very relaxing!! Thanks for sharing such a lovely tablesetting! I love your pretty china and the tablecloth also. Thanks for visiting, it's so nice that we both love lavender. Your cups and saucers are gorgeous - I've never seen that pattern before but would love to have tea with you using them. Hello Betty, Your tea cups are so lovely, and to have fresh, wonderfully fragrant lavender from the garden! I do have some Lavender in my little garden, but I never did cut some to bring into the house to dry :( I'll have to remember to do that next year. Your lavender pictures are really just beautiful! 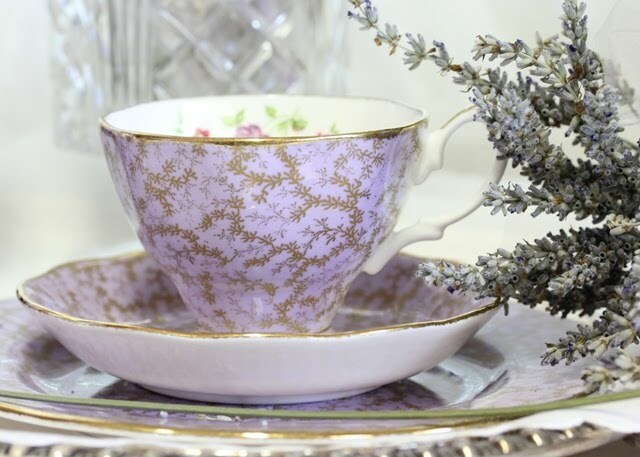 Lavender and teacups...what a lovely combination! I'm a teacup collector, so I'm totally loving your tea posts. I love the fragrance of lavender and combined with your lovely china your tea was delightful I am sure. Have a great weekend, Betty. Oh what glorious teacups. That saucer is stunning. I can almost smell it through the computer. Lovely post. Actually when someone doesn't know afterward its up to other viewers that they will assist, so here it happens.